Individual plants typically interact with multiple mutualists and enemies simultaneously. Plant roots encounter both arbuscular mycorrhizal (AM) and dark septate endophytic (DSE) fungi, while the leaves are exposed to herbivores. AMF are usually beneficial symbionts, while the functional role of DSE is largely unknown. Leaf herbivory may have a negative effect on root symbiotic fungi due to decreased carbon availability. However, evidence for this is ambiguous and no inoculation-based experiment on joint effects of herbivory on AM and DSE has been done to date. We investigated how artificial defoliation impacts root colonization by AM (Glomus intraradices) and DSE (Phialocephala fortinii) fungi and growth of Medicago sativa host in a factorial laboratory experiment. Defoliation affected fungi differentially, causing a decrease in arbuscular colonization and a slight increase in DSE-type colonization. However, the presence of one fungal species had no effect on colonization by the other or on plant growth. Defoliation reduced plant biomass, with this effect independent of the fungal treatments. Inoculation by either fungal species reduced root/shoot ratios, with this effect independent of the defoliation treatments. These results suggest AM colonization is limited by host carbon availability, while DSE may benefit from root dieback or exudation associated with defoliation. 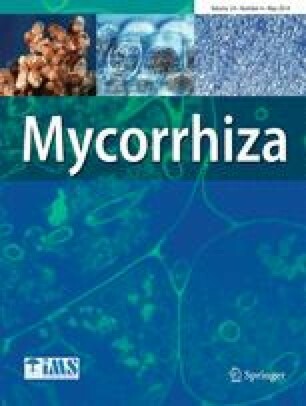 Reductions in root allocation associated with fungal inoculation combined with a lack of effect of fungi on plant biomass suggest DSE and AMF may be functional equivalent to the plant within this study. Combined, our results indicate different controls of colonization, but no apparent functional consequences between AM and DSE association in plant roots in this experimental setup. We are grateful for Prof. Randolph Currah and for Dr. Melissa Piercey for their expertise with the fungal inocula. MSc Karoliina Huusko is thanked for microscopy and other technical assistance. The project was financed by the Academy of Finland, project no. 133889 (KS) and no. 122092 (ALR) and Kone Foundation (KS).